1. It’s Wild! : Spring run-off and the wild-west. On the Yampa River, everything you see, smell, touch and hear is informed by its wildness. 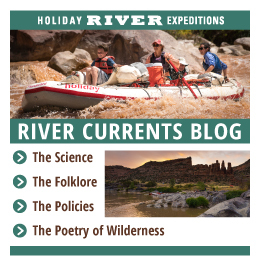 As one of the last truly wild rivers in the west, the Yampa flows from Steamboat Springs Colorado to its confluence with the Green River in Dinosaur National Monument. It remains relatively un-perturbed with relatively few interruptions. The nature of this river is just that: natural. When the snow melts, the river swells when the snow is gone the water slow to a trickle. While this can be unpredictable for energy production or consistency on the river, it does mean that when the water flows it is truly un-harnessed and as it has been for millennia. 2. It’s Wild! : Cyclical systems. Because of a huge peak water flow followed by a sharp decline means that un-dammed rivers are much better at encouraging endemic species than dammed rivers are. The Yampa boasts some of the highest rates of endangered fish species anywhere on the Colorado River system due to its high rates of cobble beaches, and silty, warm water. Natural species of trees and shrubs tend to have a better chance of fending off invasive species like Tamarisk with natural flood cycles. The Cottonwood for instance requires a cyclical inundation of water and nutrient deposits to flourish. All of these conditions mean the more endemic species, the more likelihood the ecosystem can stay resilient and diverse. 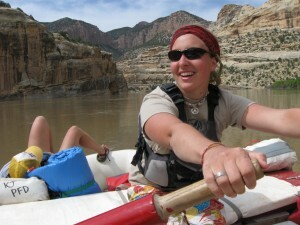 On day four of this adventure, the Yampa meets the confluence of the historic Green River. The Green, being traditionally more voluminous supersedes the Yampa and claims the name bellow the confluence, yet it is not the green but the Yampa that characterize the river bellow. Due to the natural rivers silt, temperature and unpredictable water flow, the Green River below the confluence is strikingly different than above. As you float towards the confluence a strange line appears in the water; an invisible boarder appears in the currents as the meet and merge. One side is clear green and cold water and the other defined by warm muddy flow. Not only does this provide a really funky swim break opportunity but also a physical reminder of the human imprint on the natural world. When Dee and Sue Holladay took their friends down the Yampa River in June of 1965 they had no idea what kind of a trip was in store for them. The year before Holiday River Expeditions was formalized, this expedition set off down the river expecting the same rapids that Dee and Sue had become so used to, however in a historic flooding event on the 10th of June, Warm Springs Draw sustained a massive rockslide that tore into the river and put in place the only ‘dam’ the Yampa has ever known. For hours the river did not flow as acres and acres of water pooled up behind this awe-inspiring rock wall. As with any body of water, eventually all water must find the ocean and gravity won out, in an epic event the ‘dam’ was broken and an unimaginable current of water forced its way downstream, in its wake cutting the foundations of a new treacherous rapid, Warm Springs. 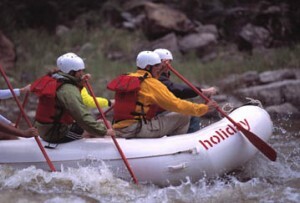 Dee, Sue and their lucky friends were the first voyage to successfully run the rapid without casualties the following day. Holiday continues to safely and smartly run Warm Springs to this day, but never underestimates the sheer power this class five rapid delivers. This was a saying my grandfather would always repeat, “you never run the same river twice”. While this is more or less true of many rivers, it is the hallmark of the Yampa. Because of its natural flow, its channel is ever changing. It re-distributes sediment along the river corridor constantly re-shaping the very channel the river flows through. Its cyclical flow is measured in an annual spring snow melt, not by the daily demand of electricity in a far-away city; each year offering more or less water and weather holding the reigns on when and how much of that snow is released. All of these variables, entirely left in the hands of Mother Nature, mean that not only is the river healthier but also less predictable than almost any other. The Yampa River is like an ideal partner, both someone you can count on through thick and thin to be there for you but exotic enough to still surprise you and keep you coming back for more.